The always kind Clerk of the School Board sent me the list of unexcused absences for the 2016-17 school year. 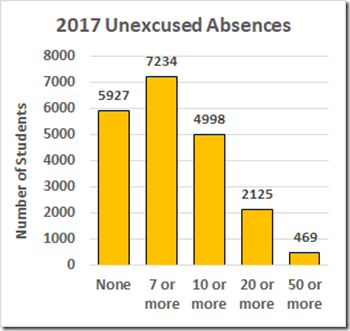 That list shows the number of unexcused absences for each of 27,221 students. CAVEAT: VDOE reports a Fall membership at RPS of 24,868 that year. 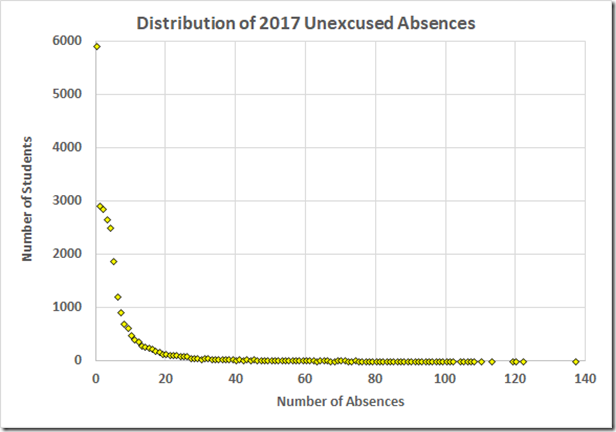 Perhaps the 2,353 difference reflects turnover during the school year; perhaps there is a problem somewhere in these datasets. In any case, these are their numbers. 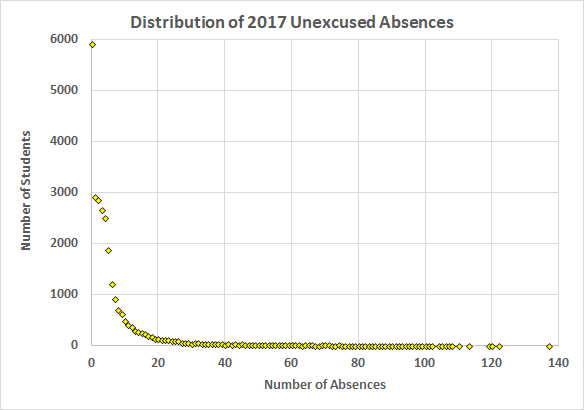 I’ll go with the 27,221 total, given that I have absence numbers for that many students. OOPS: An alert reader noticed that the axis labels were reversed on this graph in the original post. This is the corrected graph. 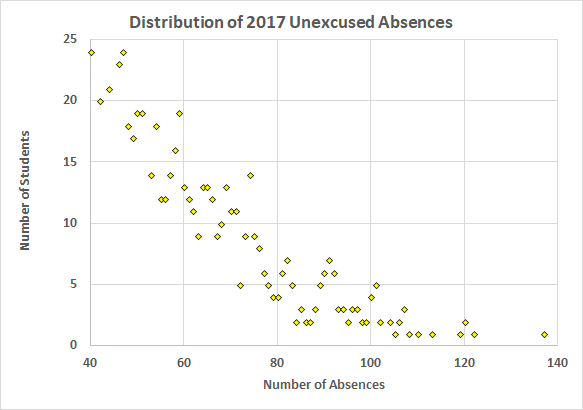 At the other end of the scale, only 21.8% of Richmond students had no unexcused absences. 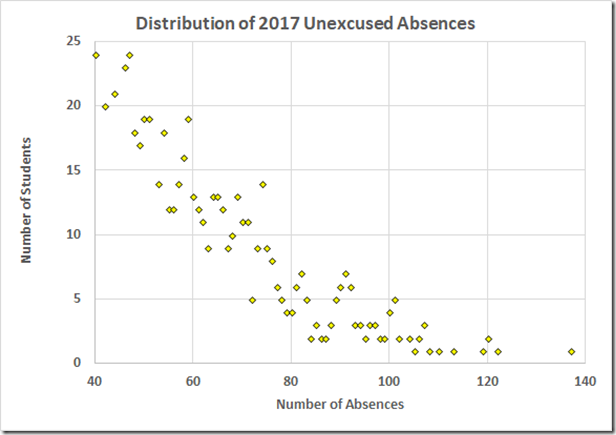 Said otherwise: 78.2% had one or more unexcused absences. 7 absences: Prosecute parents or file CHINS petition. These actions are not optional: The statute says “shall” throughout. 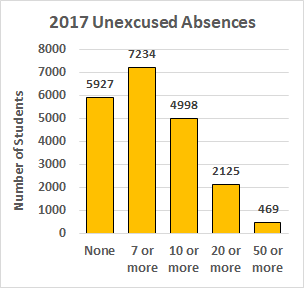 In 2017, Richmond had 7,234 students with seven or more unexcused absences; they brought 173 prosecutions and filed 60 CHINS petitions. That’s a 3.22% compliance with the law. Viewed otherwise, it’s a 96.8% rate of violation by our School Board. Our Board of “Education,” which has the duty to enforce § 22.1-258, has done nothing about this ongoing defiance of state law. In the meantime, Richmond had the third lowest reading pass rate and the second lowest math pass rate in the state in 2017.